United Right-Wing Parties list wins 8 seats in latest poll, following merger of Jewish Home, National Union and alliance with Otzma Yehudit. The right-wing – religious bloc would narrowly defeat the left-wing – Arab bloc if new elections were held today, a new poll released Thursday night shows, though the Likud would come in second to the newly formed Blue and White party. Earlier on Thursday, the Israel Resilience and Yesh Atid parties announced that they would be merging for the upcoming election, running on a united list called the Blue and White party. 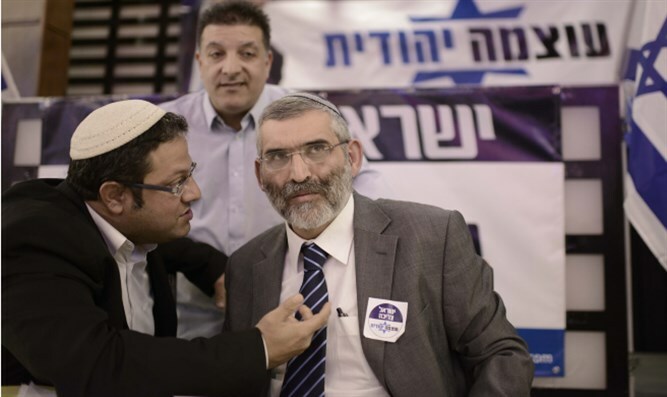 According to a poll released Thursday night by Channel 13 and conducted by Midgam Panel, the Blue and White party would win 36 seats, making it the largest faction in the 21st Knesset. The Likud, by comparison, would win only 26 seats, four less than it currently holds. But the right-wing – religious bloc would retain a narrow majority, with 61 seats to 59 for the left-Arab bloc. The new alliance between the Jewish Home, National Union, and Otzma Yehudit parties – which took the name “United Right-Wing Parties” for the election – would win eight seats if new elections were held today, roughly double what the Jewish Home and National Union have been projected to win on their own. Naftali Bennett’s New Right, which initially polled in the low double digits, has fallen to just five seats. Yisrael Beytenu is also projected to win five seats. The Israeli Labor Party, which won 24 seats in a joint list with Hatnuah in 2015, would win just five seats, while the far-left Meretz would win just four seats, barely clearing the threshold. Among the Arab parties, the joint ticket of Hadash and Ta’al would win 10 seats, while the Balad and United Arab List would barely cross the threshold with four seats. The haredi Shas party would fall from seven seats to six, while the United Torah Judaism party would rise from six to seven. Kulanu would win just four seats, down from the 10 it currently has. Gesher, Zehut, and Yahad would all fail to pass the electoral threshold.